This article will give you essential revision tips that will help with exam preparation for teenage students. I recently addressed a bunch of parents at the BDA Pop Up Parent event in Colchester. The aim of the event was to inform parents about key aspects of dyslexia and to highlight resources that are available. I love these events! As a parent of a dyslexic daughter, I really love meeting with other parents who have had similar experiences. I met one parent who has a daughter who struggles with reading and writing and has slow processing challenges. What really impressed me about her was that the parent not only has succeeded in supporting her daughter through education but she also wanted to share materials that she thought would help other kids to learn with similar challenges and so as a result set up a publishing company called Oaka Books. I don't want to go into detail as to what Oaka Books do but I do recommend checking out their website as they do have a lot of accessible and engaging content that will help with curriculum-based learning. A revision tip from the free Oaka Guide To Revision. What I do want to do is share a free resource that they have published which is a 'Revision Tips Leaflet' that gives some really good insights about how the brain works in terms of memory, planning revision and how a student should look after themselves so that they are in the very best condition to absorb as much information as possible in preparation for exams. It is a short, engaging and well-illustrated read which I think is awesome. 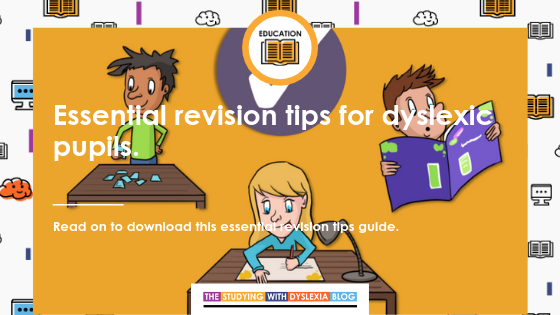 Sometimes revision is hard for a young person because they don't really understand what should and shouldn't work when revising, the insights in this free leaflet really help to understand how revision works and what to do to make it effective. Please note that this article has not been written as part of a paid partnership with Oaka Books and that I am sharing this because I genuinely think that it is a useful guide. Click the banner below to download your copy of the "Oaka Guide To Revision That Works".